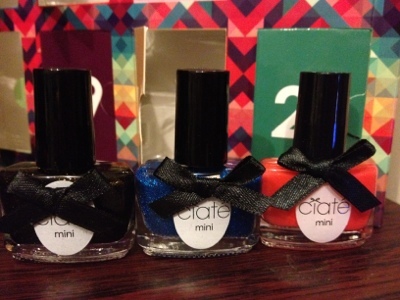 I think I've had my favourite shades from the Ciate calendar over the past few days. Two of the three polishes are glitters, which is my favourite! 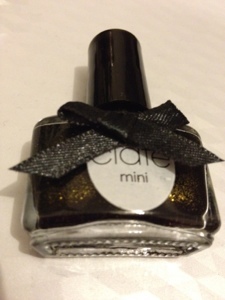 I received Twilight, a black polish shot with gold glitter. This has to be my best one so far! There was also Glass Slipper, an electric blue glitter which I think will look fantastic layered up to be opaque. The third polish is a bright orange, Speed Dial, which I will be saving up for spring. You can see the gold in this shot a lot better. 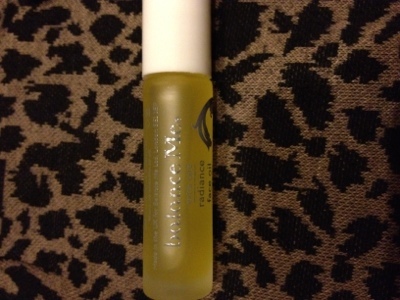 Balance Me Radiance Face Oil - I'm looking forward to trying this. There have been a lot of Balance Me products in beauty boxes recently but not this one, so it will be good to test it out. St Tropez instant glow body lotion - I think this is one product I won't use. I don't wear fake tan at all, so this will probably get gifted away. 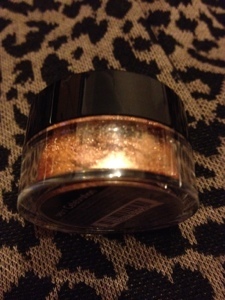 Bella Pierre loose eyeshadow in Celebration - this is a gorgeous bronze loose powder. I've not tried any Bella Pierre products before so I hope I like it! Bella Pierre eyeshadow looks so pretty! 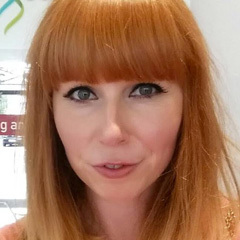 I'm not a fan of fake tan either, it doesn't look good on me, I always give those products away..